The view from the central monument at Carrowmore looking up to the great cairn on Knocknarea. The site known as Listoghil is the large focal monument at Carrowmore with a diameter of 32 meters with a long and interesting history. Listoghil is the central structure of Carrowmore; the other monuments are arranged around it in a large oval pattern, and many of the smaller chambers are directed towards it. 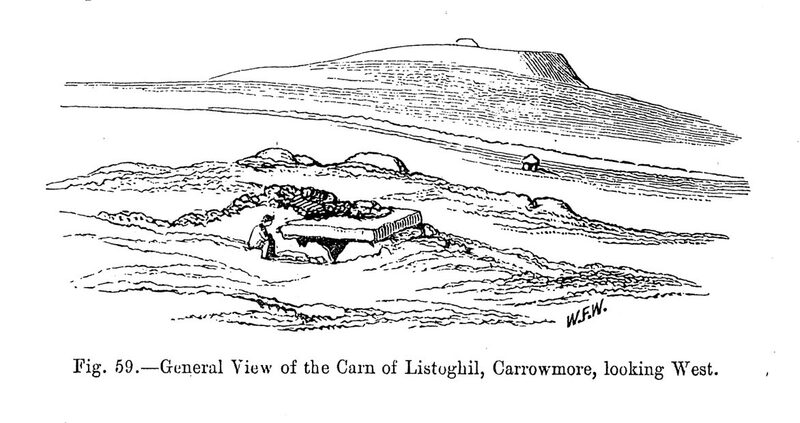 Listoghil differs from the other monuments in that it has a large rectangular chamber covered by a massive limestone roof-slab from the Glen of Knocknarea 3 km to the west. This monument was a superb place to view the surrounding horizon. The chamber was constructed around 3,500 BC, free-standing within its circle like the smaller monuments; some 300 years later a cairn was raised around the monument. Excavations discovered little evidence of a passage leading to the chamber, the monument was free-standing for at least 300 years, before being buried within the cairn around 3,200 BC, contemporary with Queen Maeve's Cairn, Carns Hill, and the monuments in the Boyne Valley. The view from the central monument at Carrowmore looking up to the great cairn on Knocknaea by William Wakeman about 1880. The cairn had been robbed of stone to build fieldwalls. Local reported to George Elcock that they remembered it to have been of a great size. It may have been of similar appearance to the platform cairn at Cairns Hill. When I visited it first in 1993, the cairn was about 1 meter high, with the chamber roof-slab visible in the centre. The site was excavated in the late 1990's by Burenhult's team of archaeologists, and the cairn has been re-built by the heritage service. No passage was found, so a modern corridor leads into the central construction. The cairn is bounded by a ring of 101 gneiss kerbstones. The chamber is built of six boulders and, as mentioned is covered with a massive limestone flag. The axis of the monument is oriented along the NW/SE winter solstice sunrise/summer solstice sunset axis. It is somewhat like a mixture between a wedge monument and a portal dolmen, as the capstone, as the roof-slab is slanted with the higher end to the south west. The original spalls (small stones) can be seen between the orthostats and the roof-slab. 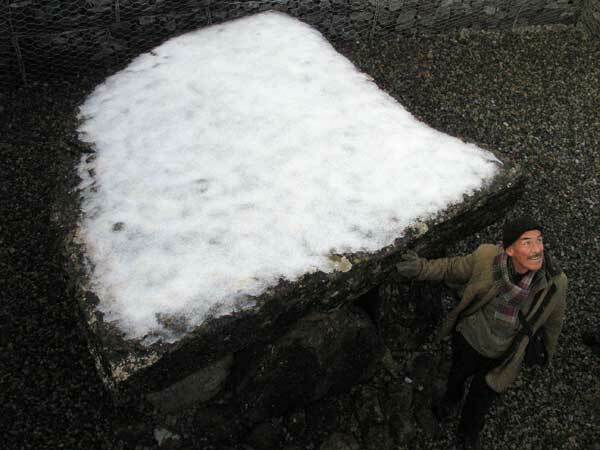 The massive 8 ton capstone, with a sprinkle of snow. Antiquarian reports suggest that it was surrounded by a low platform. Bergh has surveyed this platform, which encircles the monument. It is 8 meters across and about 0.3 meters high. It is said to have had a ring of standing stones around it's outer edge. Bergh has noted similar encircling platforms around Queen Maeve's cairn on Knocknarea and Cairns Hill west, both of which are visible from Listoghil. The excavations dated the monument to c. 4100 cal BC using charcoal from a possible satellite south of the kerbstone circle. Nine dates from charcoal in ritual type pits and burnt layers around the central chamber, centring on 3550 cal BC. Wood-Martin's excavation report is on the next page. The main find was made by Walker, a flint spearhead which now resides in the Duke of Northumberland's collection. 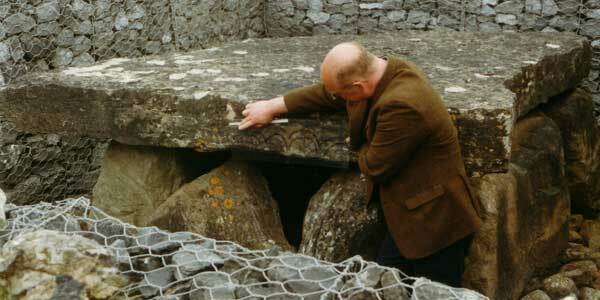 Stefan Bergh shows the location of the engraving on the edge of the roof-slab during the Stones and Bones conference in 2002. In 1994, local artist Patricia Mulligan recorded a megalithic engraving on the front edge of the roof-slab. The design is a set of three arcs and a circle above the entry. Interestingly enough, several antiquarians had claimed to have noticed engravings in this structure in the past - Elcock in 1883 and Breuil in 1921 reported to have discovered lozanges and concentric circles within the chamber. In the late 1990's a second carving was discovered in the central chamber: an engraving on one of the orthostats which somewhat resembles the Indian OM. perhaps the markings on the roof slab represent the standstill of the sun in a much earlier version of the well known triple spiral at Newgrange. This monument was in the news in 2003 over a contraversial restoration programme by Dúchas, the Heriage Service. This involved surrounding the monument with a lining of stone gabions - more commonly found on the side of new motorways. The digger, which was used to place the gabions, left trenches up to 60 cm deep through the middle of Carrowmore. There was plenty of debate about the monument: should the cairn be replaced or not. At one stage there were plans for a concrete covering dome like the one at Fourknocks. Listhogil is the central and highest ridge in Carrowmore, which is located at the centre of the penninsula. From the roof slab of the central chamber at Listoghil, there was an impressive view of the surrounding landscape. All the major sites of the region are clearly visible and well aspected: Knocknarea, Benbulben, Cairns Hill, the four cairns on Sliabh Da Ean, Union Hill - where two more boulder circles were recently discovered, Carran Hill, Moytura, Carrowkeel, the Bricklieve Gap and Kesh cairn, Croughan, Knocknashee and Doomore. Listoghil is a perfect platform to observe the movements of the heavenly bodies. The axis of the chamber is oriented towards the line of the mid-winter sunrise, in the region of Sliabh Da Ean. The landscape to the north viewed from the main monument at Carrowmore.